Female pattern hair loss / pattern thinning is a common hair loss condition seen at Sussex Trichology clinic. Shuna Hammocks talks about women pattern hair loss and treatments in this video. 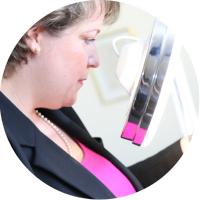 Welcome to Sussex Trichology, my name is Shuna Hammocks and I am a Consultant Trichologist. I want to talk to you about genetic thinning in women, which is pattern thinning affecting the top of the head, which causes a lot of distress and causes the patient to feel quite self-conscious about their hair. Patients feel that it is difficult to style the hair and that it has a real impact on the quality of their life. It affects women from any age, from puberty up to the menopause. It is a condition that causes the top area of the head and the crown to thin and make the scalp more transparent. It causes the patient to feel really self-conscious and it is incredibly upsetting when their crowning glory is not as it should be. This condition comes about when the circulating androgens topically on the top of the head, which cause the hairs to appear finer than the sides and the rear of the scalp and it’s quite progressive and really quite slow. This condition can be treated very well at Sussex Trichology; it can be maintained and even improved. Many of my patients who I see are incredibly happy with the treatment that we provide and the on-going support is essential in this highly emotive condition. Please contact me at the clinic and I will be happy to discuss it further with you. My hair is thinning in the middle. Most women with this condition feel that the frontal hairline is quite stable but the area behind this extending to the crown, has become gradually finer and is now revealing more scalp than previously ( or indeed, than the sides and rear of the scalp). I can stop this and in most cases also improve the density within this area. This doesn’t have to involve an oral hormone, steroid treatment or minoxodil.